How you hold your pick is at the heart of your picking and strumming technique. Where you move your pick determines the fluency of your plectrum style. Bring your thumb and first finger together in such a way that your first knuckle of the thumb is next to the first knuckle of the forefinger. As indicated by the arrows in the image below. Then place the pick in between the thumb and forefinger joints so that the tip of the pick protrudes from between the thumb and forefinger. And the tip of the pick (horizontal arrow) is in line with the two joints (vertical arrows). 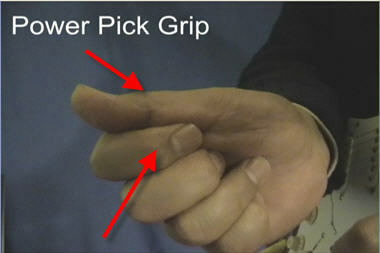 Now that you have the grip organised, next thing to organise is the path of the pick through the stroke. Here's how to think about the path of the stroke. 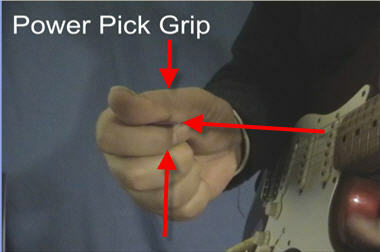 The stroke ends with the pick resting against a rest string. On each stroke, stroke through the target string and rest against the string immediately thereafter. Play downstroke on G and rest the front edge of the pick against B string. Play upstroke on G and rest the back edge of the pick against the D string. Power pick every stroke in the strings. (Even if only for a nanosecond).